There is always something new and exciting to learn about the Harry Potter film franchise. As we gear up for the release of it’s prequel, Fantastic Beasts and Where to Find Them, here are 40 behind the scenes Harry Potter facts to store in your pensieve. 1. Hedwig was played by several male owls in the movies. Some of their names were: Elmo, WTON, Gizmo, and Sprout. We doubt Gildory Lockhart had a remedy for that in Gilderoy Lockhart's Guide to Household Pests. 3. Shirley Henderson, the actress who played Moaning Myrtle was 37-years old when the Chamber of Secrets was released. She is the oldest person ever to play a Hogwarts student. 4. The visitor's entrance code to the Ministry of Magic is 62442. Those numbers spell out "magic". 6. Harry Potter producers tried to give Daniel Radcliffe green eyes. Unfortunately, the blue-eyed wizard found out the hard way that he's allergic to contacts. 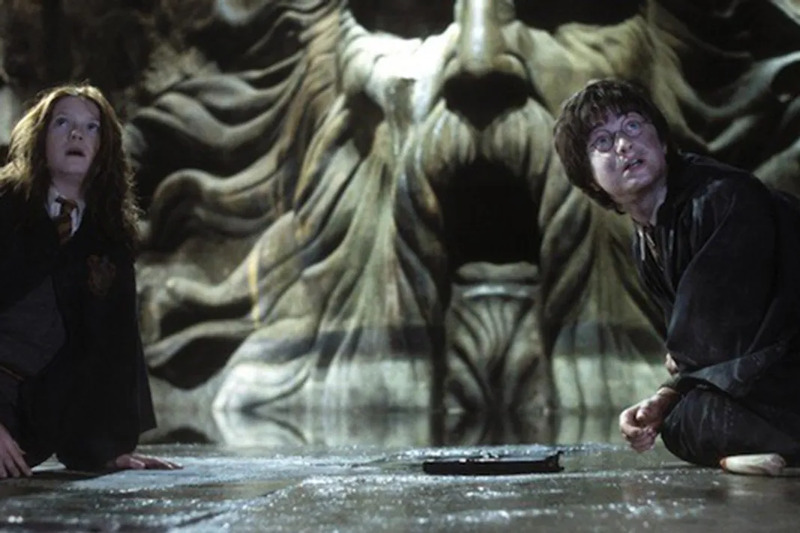 For Harry's possession scene in the Order of the Phoenix, Dan's eyes were digitally altered. 7. Hermione's buck-teeth were out too. In the book, J.K. Rowling's describes the brightest witch of her age as having bushy hair and buck teeth. Unfortunately (or fortunately), Emma Watson couldn't speak clearly with the set of false teeth she was given. 8. The Duke Humfrey's Library, which is the oldest reading room at the University of Oxford, made a HUGE exception for the Harry Potter franchise. 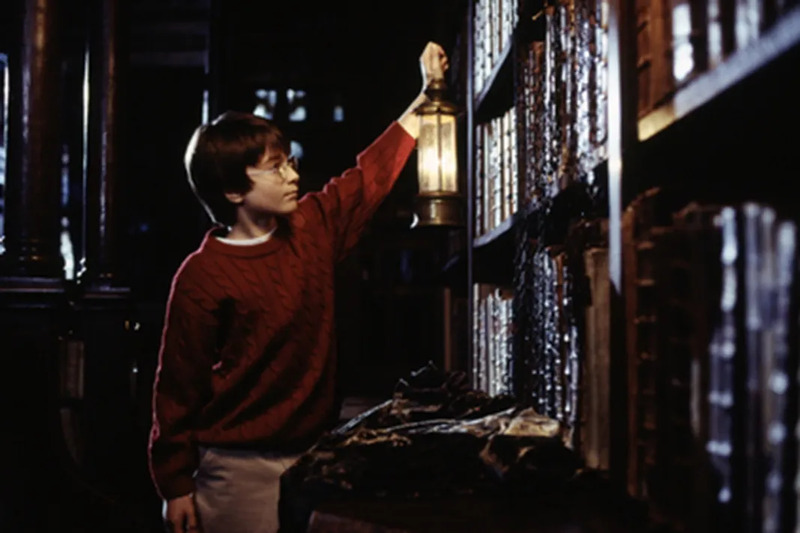 The library usually strictly forbids bringing in flames, but in order to film the Restricted Section scene in the Sorcerer's Stone, Duke Kumfrey's made their first exception in hundreds of years. 9. 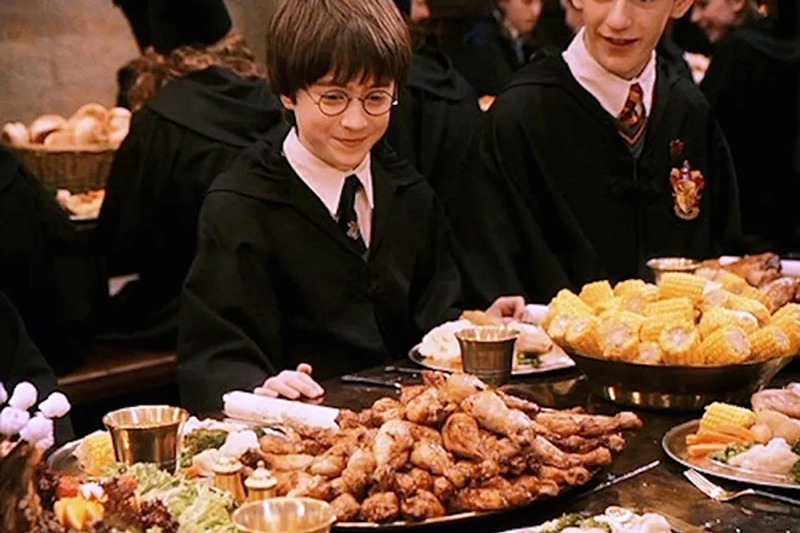 The food in the Great Hall feast scene in The Sorcerer's Stone was 100% real. Director Chris Columbus wanted the elaborate feasts to mirror the books as much as possible, so he demanded that all of the food be edible. However, under the hot production lights a lot of the foot spoiled quickly, and left a foul odor behind. For the rest of the films, the food was frozen and molds were used to make the items look more realistic. 10. Harry actually never casts a single spell in Harry Potter and the Sorcerer's Stone. Perhaps he really did rely on luck at first. 11. Dan Rad went though about 80 wands from the Sorcerer's Stone to the Deathly Hallows: Part 2. Apparently he adored fiddling with them. 12. All of that delicious butter-beer was something else entirely. 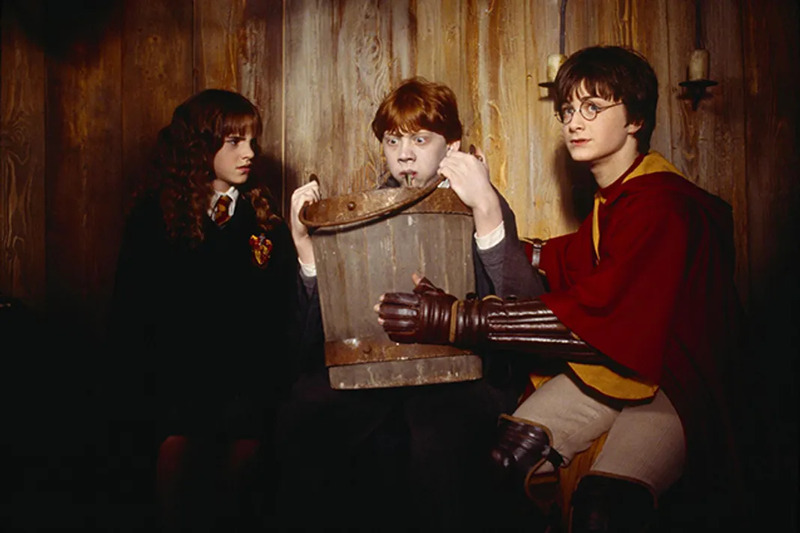 It was apple juice, the number one drink of choice of muggle children around the globe. 13. All of the deaths, petrifications, and stunning spells required a ton of body casts. 250 of them to be exact. 14. The Chamber of Secrets door actually works. You just have to be able to speak parseltongue to crack that baby open. 15. The house points counter located in the Great Hall caused a shortage of Indian glass beads. 16. 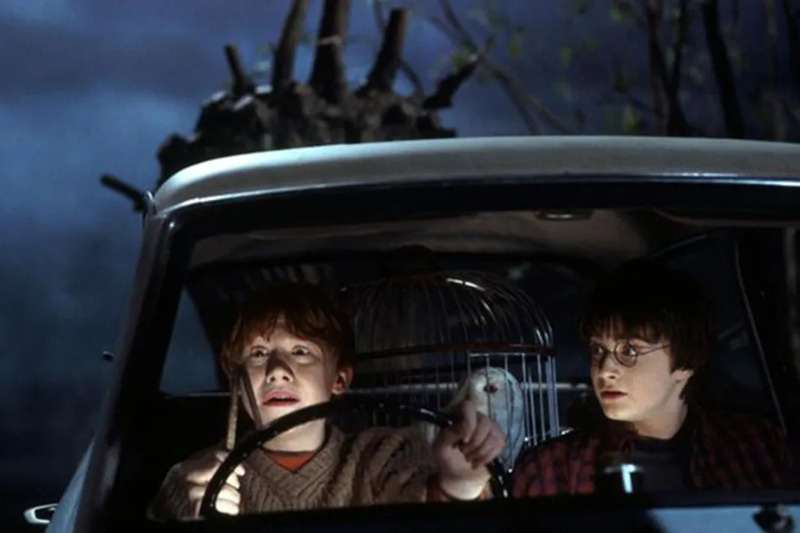 The Whomping Willow ruined a lot more cars than Mr. Weasley's flying one in the Chamber of Secrets. Fourteen Ford Anglias were wrecked to create that scene. 17. Tom Felton improvised one of Draco Malfoy's most iconic lines. Malyfoy tells Goyle, "I didn't know you could read" in the second film because Felton had actually forgotten his real line. 18. 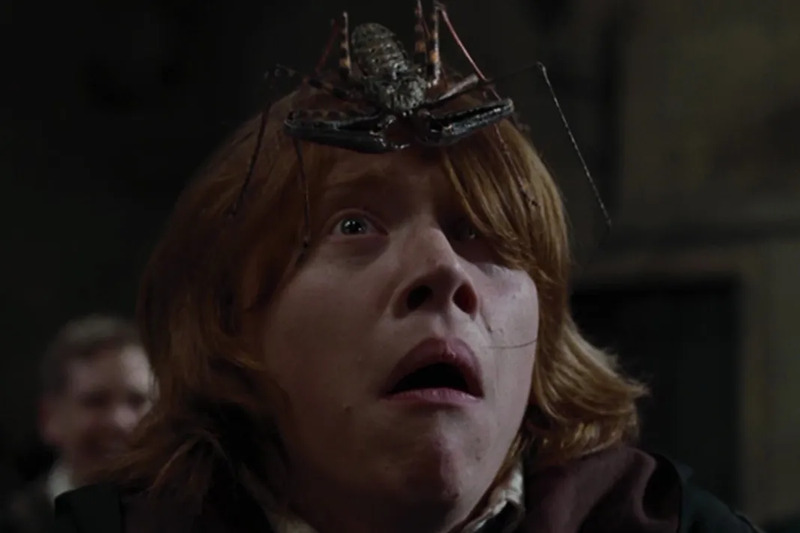 Rupert Grint is actually legitimately terrified of spiders. Neither Rupert or Ron were too pleased about meeting Aragog or his hoards of children. 19. Hogsmeade and Diagon Alley were crafted using the same sets. Warner Bros. had to save their coins somehow. 20. Speaking of re-purposing, the neck from the Basilisk was reused to create the neck of the Hungarian Horntail. However, the flame from the Horntail was so hot that it turned the dragon's snout flaming red. 21. The kitty who played Mrs. Norris was really naughty. She once stole a sandwich that actor David Bradley (who played Filch) was eating, right out of his hand! 22. The Potions classroom was really creepy. The jars that lined the walls were filled with baked animal bones, dried leaves and herbs. 23. Dudley had to wear a fat suit. In Rowling's novels, Harry's muggle cousin Dudley is described as looking very similar to a pig. 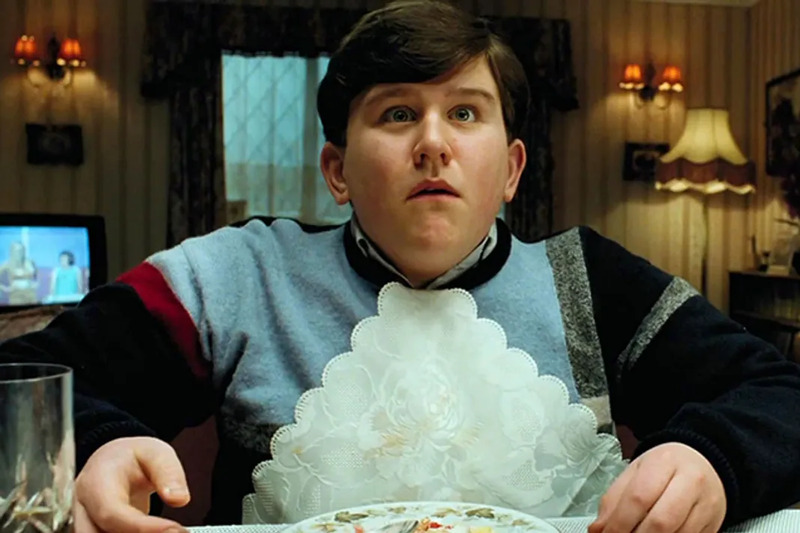 However, Harry Melling who played Dudley lost so much weight between Chamber of Secrets and Prisoner of Azkaban that he had to be stuffed into a fat suit. 24. Alan Rickman wore black contacts to play Snape. His robes were the only character's costume that also never changed throughout the entire series. 25. Dumbledore’s Memory Cabinet was super intense. Every single memory vial has its own handwritten label. 26. The Knight Bus was made out of three vintage London double-decker buses. 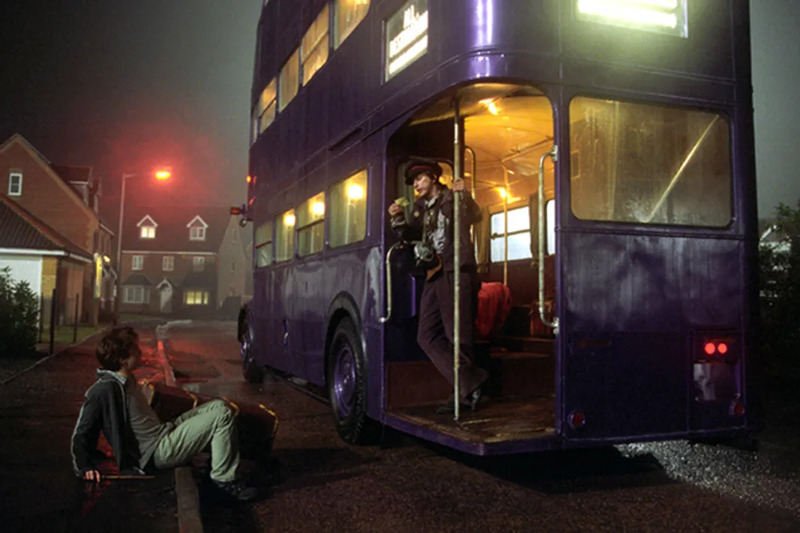 Furthermore, when shooting the Knight bus montage for the Prisoner of Azkaban, the streets of London were shut down for eight nights over the course of eight weeks. 27. The Black family tree tapestry was super detailed and legit. 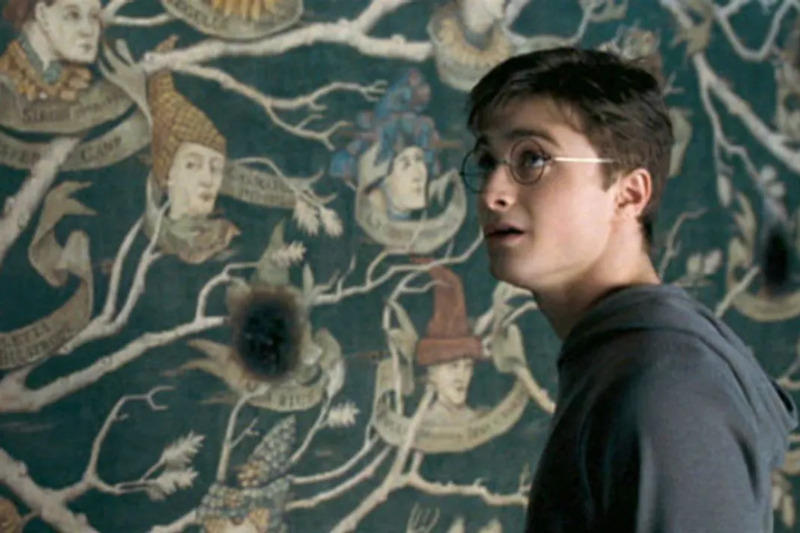 J.K. Rowling actually provided over 70 names for the Black family tapestry as well as the detailed relations between the family members. (If you recall pure-blood Wizarding families were actually super inbred.) BLEECH! 28. Tonk's hair was changed from the books description of pink to purple. In the book Tonk's hair is bubblegum pink, but pink was the color reserved for the diabolical, Dolores Jane Umbridge. 29. Olivander's wand shop was amazingly detailed. 17,000 hand decorated and hand-labeled wand boxes were placed in the shop. All of these wands and Lord Voldy was so pressed to have the Elder wand. SMH! 30. Baby Tom Riddle is actually related to Lord Voldermort IRL. The young version of Voldemort in Harry Potter and the Half Blood Prince is Hero Fiennes-Tiffin aka, Ralph Fiennes nephew. 31. 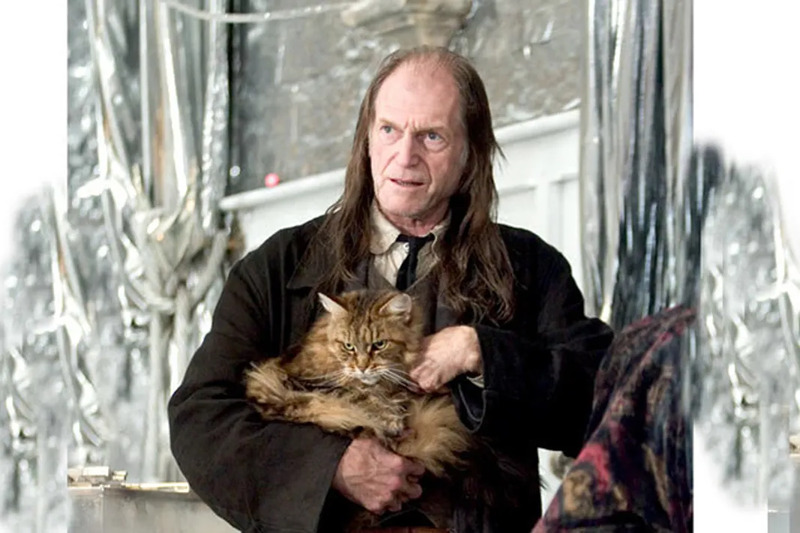 Bill Weasley and Mad Eye Moody were also related IRL. Domhnall Gleeson who played Bill is the son of Brendan Gleeson, who played our favorite loony Auror. 32. 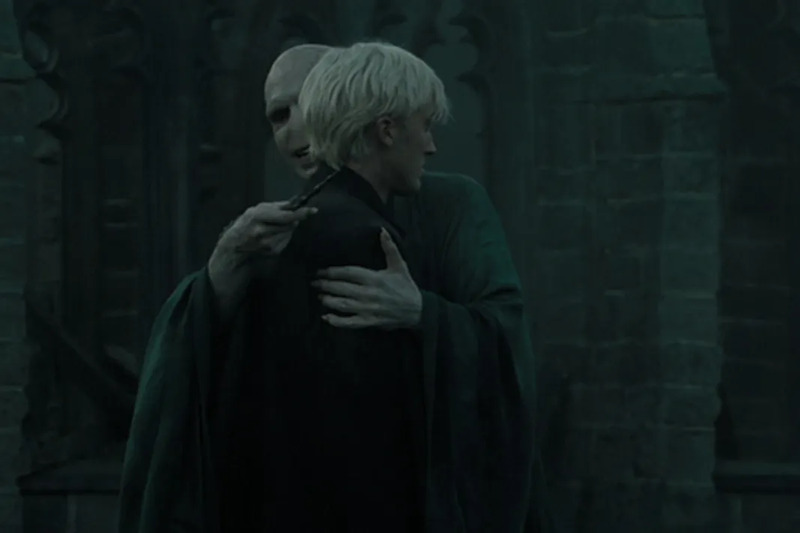 Ralph Fiennes improvised that scene of Voldemort awkwardly hugging Draco. Which is why Tom Felton's visceral reaction was so amazing. 33. Wands weren't the only thing Dan Rad used a ton of, he also wore 160 pairs of glasses while filming HP. This makes sense since Dan grew over the course of 10 years. But, we've also wondered why the wizarding version of lasik was never available to him. The lighting bolt shaped scar on his forehead was also applied 2,000 times. 34. Tom Felton was clearly always meant to be a baddie. Felton loved to sneak food on set. It became such an issue that the costume department began sewing the pockets in his robes closed. 35. Hermione's first entrance into the Yule Ball wasn't so elegant. Emma Watson actually tripped, fell and ripped her fancy dress. 36. Hagrid's beard had secrets. While filming, actor Robbie Coltrane got both a mini-fan and a fruit bat stuck in his beard. Hopefully this was before Hagrid was trying to impress Madame Maxime. 37. 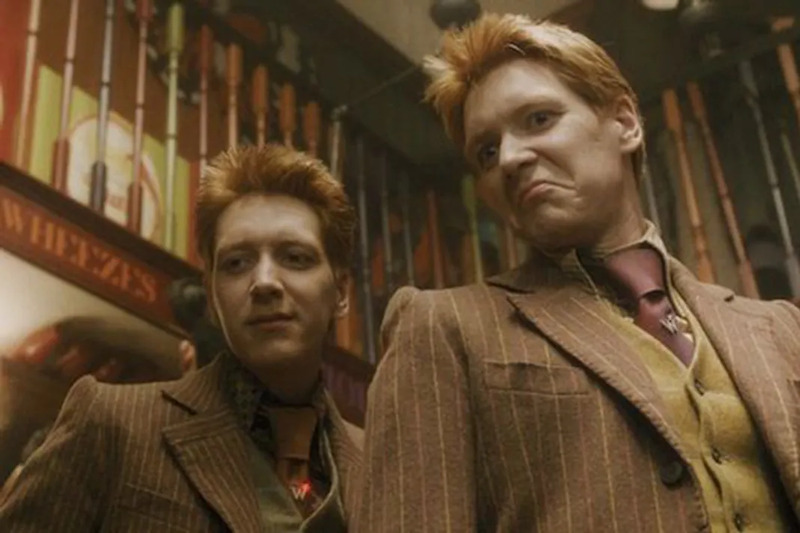 The Weasley Twins were real-life pranksters. 38. Hagrid had two huts. One was larger to appear huge from Ron, Harry and Hermione's viewpoint, while the other was smaller so Robbie Coltrane who played Hagrid would appear larger than everything else in it. 39. Hermione and Harry's Horcux kissing scene was ridiculously awkward. So much so that Rupert Grint was removed from the set because he kept cackling with laughter. 40. The moving portraits at Hogwarts were of all of producers who worked on the Harry Potter franchise. Who wouldn't want to be immortalized that way?